It takes me a moment to make up my mind, then I turn over and swing my feet out over the bed. It takes a moment to stand on my feet, pull my housecoat over my shoulders, and fumble for my slippers. My right paw finds a hair tie, and my long, black hair is pulled into a unitail , resting lazily along the back of my neck. I glance into the mirror and snort. A unitail would have to do, even if they look ridiculous on an Acara. It only takes a few moments to march into the living room. The lamp, one of the few electric lights we have in the house, is switched on. 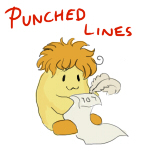 My owner, won_shi_tong, is curled up on the red couch, reading the Neopian Times and laughing quietly to herself. We call her Won. She hears me coming and looks up from the pages of small print, over the top of her glasses. When she sees me, she stops laughing. Obviously not, by the way she is reading my face, but still she asks. “As far as I know. He’s been in there for a few hours.” Won jerks her head towards a corner of the room that had been curtailed into a small private studio, with two desks for drawing, writing and painting. She and my brother master_piandao use it the most. “Can you drag him out of there for me?” I plead. I walk over to the curtained spectacle but I know better than to yank the curtain inside. It could startle my brother, and the sumi ink could be spilled or the painting could be ruined with one false brush stroke, and materials are expensive. Instead, I call out to him. “Fine then. I’ll leave some for you.” His head disappears back behind the curtains. I walk back over and plop down on the opposite end of the couch. Won shifts her bare feet, drawing them to herself. She doesn’t say anything about what time of night it was. She doesn’t say anything about the sudden project I am undertaking either. The newspaper hides her face. I sit back and remember what happened this morning. I hated it when master_piandao said stuff like that. My hands were already shaking from nerves; he didn’t need to state that and make it worse! I bit my lip and gently placed a line onto the paper with one fluid stroke, just like he taught me. I did it again. And again. Meanwhile, my brother stood behind my shoulder, saying nothing. I could only hear his breathing. I put down my brush in frustration and put my head on my paws. The picture I was attempting to paint, one of the Soup Faerie, painted in the traditional Shenkuu style, had failed miserably. This faerie looked like a fat Tuskaninny with airplane wings. I wanted to give it to her as a thank you present, but that didn’t look like it was going to happen now. Judging by the slight whistle of the air coming out of my brother’s nostrils, he wasn’t very happy about the painting either. 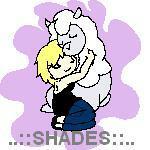 Piandao exhaled softly. Then he muttered, “Let’s stop for the day. We can try again tomorrow.” You can tell that he was annoyed, if only because a sheet of valuable art paper had just been ruined. As the teacher, he didn’t say anything. As an older brother, he wanted to. I didn’t think that he had heard me. Though it is more than twenty minutes, Piandao finally walks out of the studio, holding the completed painting (a picture of the sunsets in Tyrannia) delicately, like it will burn to ash in his grasp. I march right in and gather the inks, brushes and red and yellow paints, staying quiet as I know that my eldest brother is probably fast asleep. He tends to rise and fall with the sunlight, not caring for the views of Kreludor, as I do. I rummage around in the cardboard box below the desk, containing all of the art odds and ends. Finally, my paw closes around what I’m looking for. It takes me only a moment to light the candle and place it in the lantern. I do not need its light or heat, but I need a reference point. Within a few minutes I am ready. I sit down on the chair, well-worn with frequent use, and stare at the candle flame, wondering how I will transport its light into a page so that it would almost seem to glow. Out of my three brothers, Iroh_dragon is the kindest. He shows kindness to me, Piandao, jeong_jeong, Won and every other person he’s ever met. 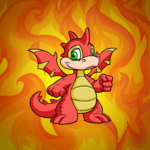 He is also a rarity among most Neopets in that he is, well, old. He is also a little pudgy, but he can fight like a Kougra in the Battledome. You’d never really think it of him, as his personality is like that of a plushie; big, friendly, kind, loving and huggable. It's he who keeps the family together, even after Won joined us and took responsibility for us. Whenever Won makes an important decision, it's Iroh that she discusses it with the most, which we accept. He is the eldest, with seventy two human years under his belt, and we all respect him for it. But he is old. Back home, in Shenkuu, being old meant wisdom. It meant respect, and reverence, and power. The sight of his long beard and topknot, turned white with age and contrasting sharply with his red scales, would cause the youngest in society to rise in respect as he passed them. Being old meant dignity and poise. Being old meant that you had survived this far, and had lived well. However, Neopia Central is not Shenkuu. Tyrannia, where we moved and now lived, is not Shenkuu. Here, there are many more elderly, but they are not given any respect. They are not acknowledged for the life they have lived and the contributions they have made to society and the wisdom of the ages. The youngest ones often mock them for all of the troubles that come to them in their old age; to them, it is weakness. I cannot help but laugh at them to disguise my disdain. What Iroh is, they will someday become. My other brother, jeong_jeong, has sixty six human years under his belt. Once, a group of troublemakers called him a geezer, but he challenged them to duel in the Batttledome to restore his honour and show his skill. It worked, and they never bothered him again. Iroh_dragon is not like that. That is what terrifies me. I place a stroke on the paper. And another. And another. It’s better to add the base colours first if one is to use a watery ink. The paint will be placed to dry first, then the ink on top of that, so it won’t bleed all over the page. Firelight, shaped like a fan, is spewed all over the page. It appears to be working. I’m not messing it up too badly this time! I place my brush down on the inkstand, satisfied momentarily, then place the painting in the stretching rack to dry properly. The inking will come later. I temporarily emerge from the studio, intending to grab an apple and a glass of milk. The clock above the couch says that it’s 12:30 PM. I do a double take. I’ve been painting for almost three hours? No wonder I’m starting to get drowsy. Won shrugs, then rolls off the couch and heads on down the hallway. She’s a college student, so she doesn’t put up a fuss when we stay up late to work on projects, mainly because she often does the same thing. The paint will take half an hour to dry, so I plop down on the couch and pick up the Neopian Times. Ironically enough, there’s a humorous article on the front page stating how to deal with aging. I guess that’s what Won was laughing about earlier. The memory comes back, unbidden. One of the things that Iroh_dragon loves to do is to sing for people. Sometimes, if we’re running low on neopoints, he’ll go out to a street corner in Tyrannia or Neopia Central and sing, with an open cardboard box in front of him marked “donations”. Jeong_jeong, Piandao and Won hate it when he does this, because lots of times he has to run from the Defenders of Neopia (though he has yet to be arrested for it), but I don’t mind it. Sometimes I go with him, and it usually earns us about a thousand NP, which isn’t bad overall. However, today was different. We were in the suburbs of Neopia Central, and Iroh was singing a ballad about Queen Fyora. For the most part, people were being courteous, and we got the odd twenty or ten NP. Iroh’s voice, cracked with age but still strong, with a slight accent, drew everyone’s attention. Then that Lenny, with that self-satisfied smirk, came along. He carried a sharp Quasalan sword, which he pointed at my brother’s feet. “How would you like to earn yourself five thousand neopoints?” he said in a nasal tone. My eyebrows rose at that. What kind of neopet has five grand to pay a street musician? “Sir, that is very generous of you!” My brother scrambled to his feet at once, wings flapping clumsily. “What would you like me to sing for you?” His eyes became eager. He knew that five thousand NP could feed us for a while. The Lenny listened for about thirty seconds, frowning. He didn’t really notice the glare I was giving him that stated, clear as crystal, “Give him some respect!” Suddenly, without warning, he shoved his sword at Iroh’s feet. Iroh hopped on one foot, never missing a beat to his song. I leapt to my feet instantly, silently taking the ice shard I always have on hand out of my pocket. Iroh, seeing what I was doing, made a silent hand gesture that simply meant “Don’t.” I seethed silently as the Lenny repeated the action several times, causing my brother to move wildly about, his singing now warbled. Well, he is the eldest. I stepped back and put my ice shard back into my pocket. Iroh let go of my arm with an apologetic look. He placed the bag of neopoints into the cardboard box, and then began to sing again, only this time his voice was troubled and lackluster. He continued on for a few more minutes, singing about Taelia, the snow faerie. Suddenly, he stopped in mid-note. His eyes were vacant, distant. “Let’s go,” he said, his voice hollow. “We’re done here.” I didn’t argue. There are several more candles lit around me now, this time for a source of light, encased in glass lanterns so that the crumpled pieces of paper that litter the studio would not catch on fire. I am carefully adding the lines for the wings, using the tip of the brush to add the details on the glossy scales. This doesn’t have to be perfect, but... my paws are shaking. I have to put the brush down. Iroh cracked on the way home. Not on his own, mind you. We were near the Defense Magic store. We had ducked in there to get me a small shield, because my defense in the Battledome is terrible. Well, when we came out, there was a group of city youths there. Once they saw Iroh, they started smirking. Iroh walked on ahead of me, holding his head high, looking straight ahead. 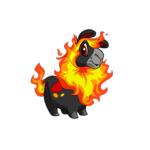 The biggest one of the bunch, a fire Eyrie, stepped in front of him, blocking his path. I walked several yards behind him, doing the same. “Excuse me,” Iroh_dragon said politely, stepping to go around him. The Eyrie shifted his stance, blocking his path again. I seethed and took a step forward. I started walking towards them, my right paw slipping into my pocket. It closed around the ice shard. “Please move. I’ve had a bad day.” I saw his paws curl into tight fists. Again Iroh moved to get around the deviant, and again his path was blocked, except this time the Eyrie poked him in the chest with a talon. “Hey!” I exclaimed loudly, breaking out into a run. The Eyrie nodded, and before we even knew it, the other pets with him surrounded us. They grabbed both of my arms before I could even blink. Iroh cried out and spun on one foot to come to my aid, but the Eyrie grabbed onto one of his wings and yanked, hard. Iroh fell on his back, and the Eyrie stood over him. “How can you even see at your age, much less move?” the Eyrie taunted, giving Iroh a swift kick. He grunted, then lashed out with his tail, knocking the bully off of his feet. “Let me go!” I cried, struggling wildly. Fighting one against one isn’t easy, but at least in the Battledome it’s honourable. Being trounced five-to-one is both cowardly and unfair fighting. I couldn’t free myself. Iroh jumped up, wings pumping as he rose several feet off of the ground. “If you have a disagreement with us, then state so, and we can settle it in the Battledome. Not here!” A crowd of onlookers was beginning to gather. I was furious with them. Why weren’t they calling for the Defenders of Neopia? “Why would there need to be a reason? I don’t need any stinkin’ Battledome.” The Eyrie was back up, and I gawked. He was built like a wall. “Now hand over your cash, geezer, before I turn you to a pile of ash!” As if on cue, I was shoved forward, and I sprawled flat on my face. A jet of flame emerged as I looked up from my position on the ground. The unexpected brightness made my eyes smart as it arched against a dusky sky and smacked the ground. The grass blackened and curled into itself, smoking terribly. The Eyrie barely avoided getting his wings burnt as he leapt back from Iroh’s attack. The onlookers began to scream and flee in a panic. I scrambled to my feet. “Iroh! Stop it!” He didn’t hear me. “You’re going to get us arrested!” His breath came in short bursts, and the flames spattered on the earth and flew in the air around the fire Eyrie. He was cowering on the ground, his wings wrapped around his body to shield him. The fire didn’t really hurt him (he was a fire Eyrie, after all), but just the sight of Iroh was enough to cause a stranger to duck and cover. Idiotically, I ran forward, dodging the smaller flames, and jumped up to grab his beating wings. They flexed under my paws, and the flames launched upward and died suddenly as I pulled my brother down on top of me. He struggled for a moment, then abruptly went limp. He was shaking and sobbing. I shoved him off of me, then rolled over and knelt down beside him. A shadow fell over us, and I looked up to see the shopkeeper from the Defense Magic store standing on the other side of my brother, his arms crossed. “Where are your enemies, o maiden?” the shopkeeper said. I blinked in surprise. That was a quote from one of the old Quasalan scrolls. “...Nowhere, my liege.” I murmured as I looked around me. The Eyrie and his goons had fled once the attack ended. “You did what you had to,” I murmured. I add in two curving strokes for the eye, then a final flourish for the tail. I place the brush back on the ink stand and sigh with relief. It’s finally done. All I have to do is place it on the drying rack. I blink as I see that Kreludor is no longer pouring cool light through the windows. The sun is rising, and the sky is pink. I glance at the clock and blink, shocked. 4:30 AM???? Have I really been painting all night? Iroh_dragon is walking down the hallway. Right, I forgot he exercises in the morning. He does a double take when he sees me. “Jun! What are you doing up so early?” He says this last bit somewhat cautiously. After what happened, I can understand if things might be awkward for him right now. “For me?” Iroh breaks out into a grin. I take his paw and bring him to the drying rack that is resting on the kitchen table. When he sees the painting, he freezes. His green eyes widen almost comically, and he takes in a deep breath. Abruptly, he reaches out to touch it, but draws back just in time, as the ink is still fresh. The picture isn’t perfect, but at least it looks like a Scorchio instead of a fat Tuskaninny with airplane wings. It depicts my brother with a fan of flames all around him, leathery wings outstretched, a solemnity about him. In one paw he holds a scroll, and the other clutches a sword. He has the same expression that he had the moment he finally snapped, only without the tears. Why? Because in that moment I saw my brother as he would have been in his warrior days of youth, as powerful, terrifying, passionate, and magnificent. He slowly reads the inscription at the bottom of the page, and then pulls me into his arms for a big, older brother bear hug. “I’m sorry for what I said yesterday,” he murmurs. Quietly, I read aloud the title of the painting, written in cuneiform along the bottom of the paper, the name Won wanted to give to Iroh, but couldn’t; the name that fits him best.